Nowadays consumer products are being integrated with much more powerful wireless chip such as 802.11n wireless module so that they can be connected easily without hard wires crossing all over in the home or office place. 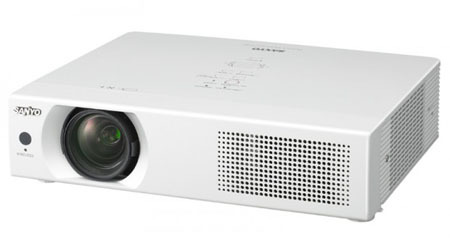 Similarly, Sanyo has just announced its latest series of WXGA video projector that being equipped with 802.11n wireless connectivity. Named as LP-WXU700, it is claimed to be the world’s fastest wireless projector targeted for enterprise use. Now with this high end projector, users can easily stream media files from PC to projector screen without jamming the limited bandwidth. Besides, there is one HDMI (High Definition Multimedia Interface) and USB port each on top of what is currently offered by embedded wireless chipset. In terms of product specifications, the next generation projector supports WXGA resolution with 3800 lumens brightness and a 500:1 contrast ratio that make it a wireless projector suitable for business and multimedia presentation with great visual experience. The product will be available by next month but however, the projector doesn’t come cheap in pricing. At a retail price of 627000 yen (around $6000), most probably it is only affordable by enterprise users especially in current economy situation.